The weather isn’t always what you want it to be, and driving in certain weather conditions with the wrong tires can be an absolute disaster. Thankfully, Harris Mazda has all-weather tires that are truly unlike any others. From their completely unique design to their impressive capabilities, you’ll certainly enjoy the peace of mind you receive with these on your vehicle as you hit the Victoria, Duncan, and Nanaimo roads. Learn more about our impressive tires below. Harris Mazda offers the greatest all-weather tires available for drivers. Our luxury line of tires can handle everything that weather throws their way, from warm, sunny days to frigid winter storms. Tread design offers superior ice and snow traction than other all-season tires. Treads are durable to withstand a variety of inclement weather and will last much longer than traditional winter tires. Wide, lateral grooves increase grip and ensure you have better traction while on the road. Multi-wave sipes help you tackle ice and snow while allowing you to maintain safe braking and accelerating. Snow claws are found inside every tire to improve deep snow traction. Evacuation grooves move the snow so that your tires are always connecting with the road, not the weather. Available in a variety of sizes, so you can enjoy the convenience and safety of great all-weather tires for any Mazda vehicle. All Mazda all-weather tires come with a warranty, so you know you’ll always be able to count on them to last when you need them most. 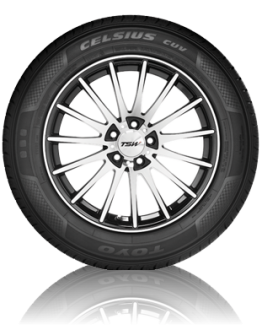 The Toyo Celsius CUV and Toyo Celsius all-weather tires feature wide lateral grooves to help reduce hydroplaning. For snowy weather these tires have snow claws to help with deep snow traction. 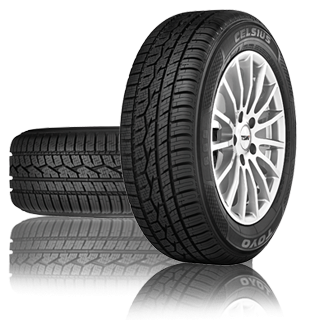 The Toyo Celsius CUV and Toyo Celsius tires exceed the snow tire performance standards set by Transport Canada. These tires feature an asymmetric variable tread pattern, variable multi-wave spies, staggered blocks – sawtooth edges, snow claws, evacuation (slush) grooves, unique tread compound, advanced tread design, alignment indicators, and added snow and ice traction for the best all-weather tires available! Harris Mazda is the best choice to receive the all-weather tires that you need in Duncan, Victoria, and Nanaimo. Our team is here to help you get the products you want with the service you deserve. We always put the power of decision-making in your hands thanks to our iBuy Responsive Shopping Experience, and we have a variety of new vehicles for you to choose from. Contact us today at 250.758.9125 to get your all-wheel tires, check out our inventory, or simply enjoy a great experience.